Elmcroft was really good. The rooms were nice and big, and they were nice, clean, fully furnished, and immaculate. The people there were really friendly. I enjoyed it and it was awesome. The food looked nice. They had an exercise activity -- which my mom needed -- they pick up people and take them out. It was just great. Thank you for your review, Rafael! We work hard to create the best environment for our residents. The best way to get to know a community is by scheduling a tour. 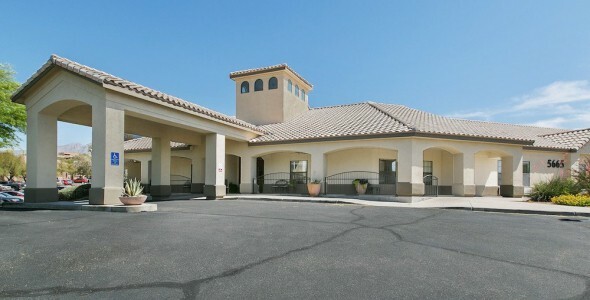 See the facilities, meet the staff and residents, and get a feel first hand what it's like to live at Elmcroft of River Centre Tucson Assisted Living. After a lifetime full of hard work and daily chores, older adults deserve the best in stress-free retirement living. That's where Residents of Elmcroft of River Centre comes in. Located in a beautiful part of Tucson, our community provides the activities and social life that keep retirement fun, while also offering 24-hour services that make retirement easy. Residents of Elmcroft of River Centre is one of the many exemplary communities owned and operated by Elmcroft Senior Living. At Elmcoft, our mission is to enrich the lives of everyone who lives with us and works with us by treating them all with dignity and respect while taking care of their individual needs. From welcoming open spaces to an invigorating activity schedule, residents at Residents of Elmcroft of River Centre are sure to have their daily needs met, but in a way they find enjoyable. That's especially true with our dining program, which features new culinary creations every day served in a restaurant-style atmosphere that promotes social interaction. We also strongly encourage our residents to chase their life-long ambitions, which is the goal of Elmcroft's Second Wind Dreams program. No matter what item residents have on their bucket list, from reuniting with long-lost relatives to swimming with dolphins, we aim to make these dreams come true and show residents that their goals are still within reach! When a new resident joins Residents of Elmcroft of River Centre, family members obtain peace of mind, knowing that their loved one will be fully taken care of. We encourage each resident to live as independently as possible, but any time assistance is needed - whether it's with getting dressed, taking medication regularly or any other daily task - we're here to help. Specially trained staff members are available 24 hours a day to help with any task, or should an emergency arise. And those same staff members work every day to make life safer through programs such as Walking Tall, which is designed to reduce the risk of falling. At Residents of Elmcroft of River Centre, we treat your family member like one of our own.